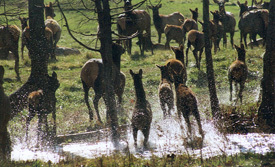 High Adventure Ranch harbors some of the finest Cow Elk Hunts in the United States. They provide exciting hunts and make excellent table fare in what is an extremely healthy red meat. High in protein, but low in fat, Elk meat has a very flavorful taste that is rapidly growing in popularity. As part of our herd management program, we routinely discount our Cow Elk hunts especially for trophy hunters looking for a less expensive animal for their wife, son, or daughter. Our herd is completely CWD free and we offer meat processing to take care of all of the butchering and packing. For more information on Cow Elk Hunting at High Adventure Ranch, please call (314) 209-9800 or fill out our contact form.